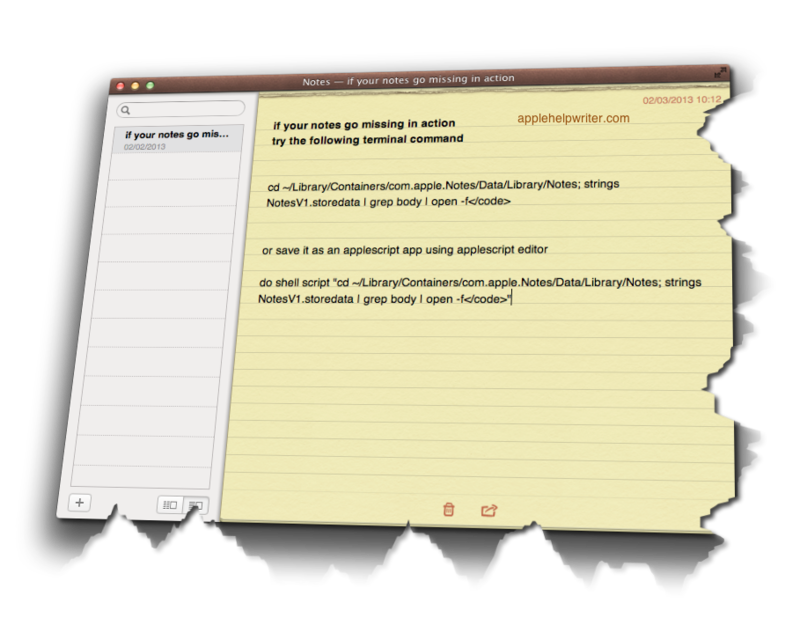 Posted on March 2, 2013, in AppleScript, Mountain Lion, Notes.app, OS X Lion, Scripts and tagged apple, applescript, disappearing, evernote, find, get back, lion, lost, Mac, missing, Mountain Lion, notes, notes.app, recovering. Bookmark the permalink. 7 Comments. Thanks! It recovered most of my annotations! when I type the command, I am told “no such file”. Any other tips – I really would like to retrieve lost notes and switch to evernote… Thanks! don’t type it. Copy and paste it directly into Terminal window. Just saved my day (even more so for my SO). Thank you so very much. One of my notes got stuck on only displaying a webpage link and would not close it or stop doing so, seemingly losing all the other text. This allowed me to see the org text. Unfortunately I do not have a mac (I have a PC with Windows…), but I have an ipad and an iphone, and my notes have just disappeared. Also, and I am not an IT guru;) Can you please say in simple words how I can restore my notes with the devices I have? Thanks a million in advance, really appreciate.